Associated with t(14;18) IgH:BCL2 genes As opposed to Burkitt lymphoma which is also CD10+ with a Ki67 of ~100, the Ki67 (proliferative index) in most Follicular lymphomas are much lower. 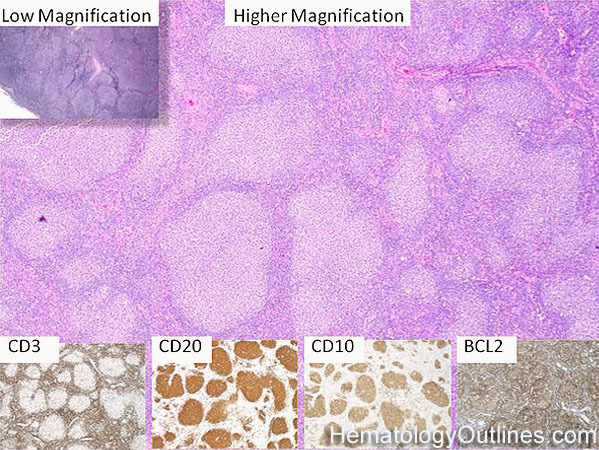 Additionally, similar to other low grade lymphomas, the BCL2 protein (anti-apoptotic protein and not the gene) is typically overexpressed in most Follicular lymphomas. 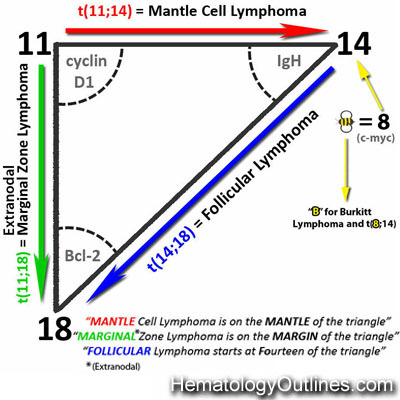 While, high grade lymphomas with increased apoptotic cells such as Burkitt lymphoma usually lack expression of the BCL2 protein.